Os grid reference: SP 4365 1647. 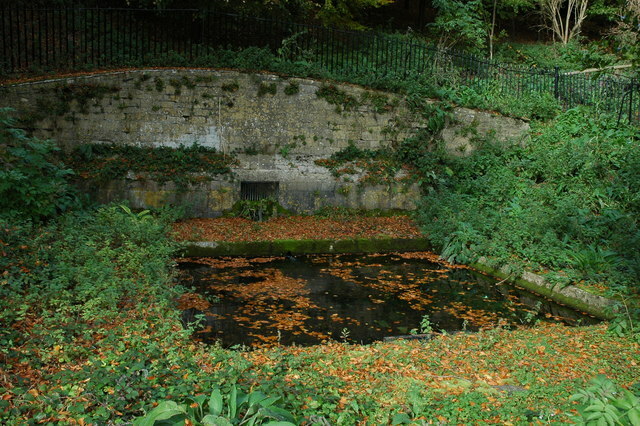 At the north-side of the lake in Blenheim Park at Woodstock, Oxfordshire, is Rosamond’s Well, also known as Fair Rosamund’s Well. It takes its name from Lady Rosamond de Clifford who was to become the lover (Mistress), for her sins, of King Henry II, although probably not ‘entirely’ out of her own choosing! Fair Rosamond, it is said, was “supposedly” murdered by a very jealous Queen Eleanor in about 1175, or was she? But back in the 12th century the well was called Everswell, maybe because it was ‘never ever’ known to run dry, even in the driest spells of weather; and in the past the water had some curative properties as pilgrims were wont to come here and partake of it in bottles – in those distant times, but in fact the well has only been named after Rosamond since the 16th century. The village of Woodstock is a quarter of a mile east of the well, while Bladon is half a mile south, and the town of Long Harborough 2 miles south-west on the A4095 road. 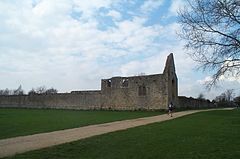 Poor Rosamond was buried at Godstow nunnery, a house of Benedictine nuns dedicated to St Mary and St John the Baptist, which is now in ruins beside the river Thames, near Oxford. It was founded by the widow Edith Launceline in 1133, dissolved in 1539, and almost destroyed during the Civil War in 1645 or 46. Today the ruin acts as a pound for local farm animals. There are only fragmentary remains of the precinct wall and chapel of abbess’ lodging, according to Frank Bottomley in his book ‘The Abbey Explorer’s Guide’, 1981. The nunnery ruins are two-and-a-half miles north-west of Oxford city centre. Today the well looks quite neat and tidy, and is surrounded by a fence, in what is a very tranquil setting close to the north bank of Blenheim Lake – in the green and wooded grounds of Blenheim Palace. The well is actually a large square-shaped pool paved all around with flat paving stones, while at the head of the pool a high, curving wall with carvings, and a square opening for the water to issue into the pool itself; the water then flowing out into the lake. Foliage and trees grow at either side of the structure, which is soon to be restored. The water is usually quite near to the top of the pool, indeed it is never known to go down by much nor to dry up when there is a prolonged spell of dry weather. Close by is Rosamond’s Bower where Lady Rosamond, daughter of Walter de Clifford, lived before her untimely death (in strange circumstances) at the age of 35 in the year 1175 – murdered, according to the legend, by Queen Eleanor after she had found out that Fair Rosamond was her husband’s concubine. However, it is said that only the king knew the route to Rosamond’s secret bower, a sort of underground labyrinth built for her by King Henry. Photo Credit: © Copyright Philip Halling and licensed for reuse under this Creative Commons Licence. Bord, Janet & Colin., Sacred Waters, Paladin Books, London W1, 1986. Bottomley, Frank., The Abbey Explorer’s Guide, Kaye & Ward Ltd (The Windmill Press), Kingswood, Tadworth, Surrey. 1981. Prichard, Mari & Carpenter, Humphrey., A Thames Companion, (2nd Edition), Oxford University Press, Oxford OX2, 1981. Categories: Abbey or Priory, Holy Wells / Springs | Tags: Fair Rosamond's Well in Oxfordshire, Rosamond's Well at Woodstock in Oxfordshire | Permalink. Thanks Ross, I thought you would like it. Glad you liked it. Is the place haunted?